Soboro donburi, also known as soboro don, is a classic Japanese dish of seasoned ground chicken served over a bed of rice. This style of dish where various combinations of food are served over rice, typically in a deep bowl, is known as donburi cuisine. Often, the term donburi is shortened to don and used interchangeably. In Japanese, the term soboro, not only refers to cooked ground chicken, but also any type of protein (meat, beef, fish, or egg) that is cooked into fine or crumbled pieces. Soboro is typically served over steamed rice, and almost acts as a type of rice seasoning or garnish, similarly to how furikake (Japanese dried rice seasoning) is sprinkled over rice as a seasoning. Ground chicken soboro donburi is often served with both ground chicken and finely scrambled egg. It is not uncommon to serve soboro donburi with strictly seasoned ground chicken, omitting the scrambled egg. Another variation of soboro donburi is the addition of cooked green vegetables such as green beans or sweet peas. 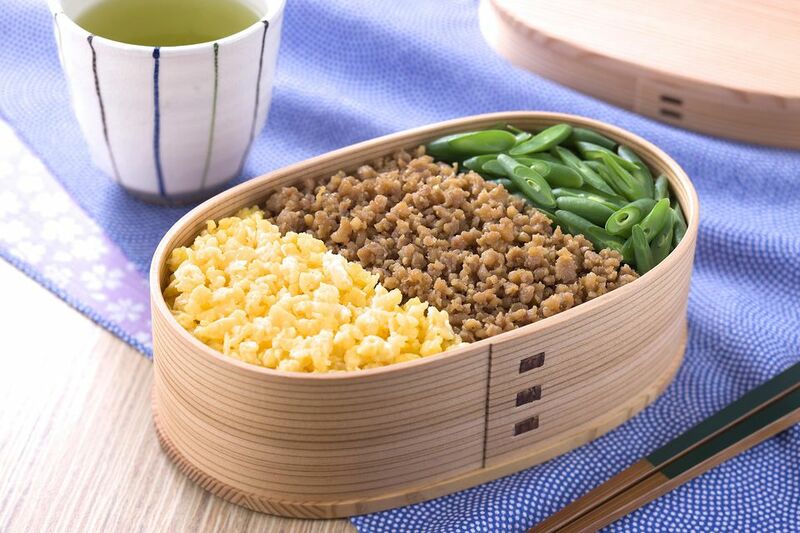 Soboro don may be served as a meal, but also works beautifully as a bento lunch. Make the soboro (ground chicken). In a medium pan, combine soy sauce, sugar, mirin, and ginger over medium-low heat. Add the ground chicken to the pan with the sauce and mix well. Simmer the chicken, and while it cooks, constantly stir and scramble the ground chicken until its cooked through. If the chicken is constantly stirred while cooking, it will help to create fine pieces of ground chicken, rather than large chunks. Set aside. Add sugar, mirin, and salt to the beaten egg and mix well. Heat a medium pan on medium-low heat. If you are not using a non-stick pan, be sure to coat the pan with canola oil to prevent the egg from sticking. Add the egg mixture to the pan and scramble eggs, constantly stirring with chopsticks. Constantly stirring the eggs will help to create fine pieces of scrambled egg. Serve steamed rice into four deep donburi (bowls). Place chicken soboro on one side of the bowl, and the scrambled egg along side the chicken soboro, creating two different sections for the chicken and egg. Optionally, create a third section with cooked green beans sliced on the diagonal.